This post is sponsored by Glidden Brand Paints. If you haven't heard about My Colortopia yet, boy do I have a treat for you! My Colortopia is a website recently launched by Glidden that has color tips and inspiration, even a blog where some of our favorite design/diy bloggers contribute their advice on color and design. And these three lovely ladies are only a few of the great contributors! Check out all of them here. Finding the colors that are right for you can be a tricky thing. Personally, I find a lot of color inspiration in nature and natural elements. 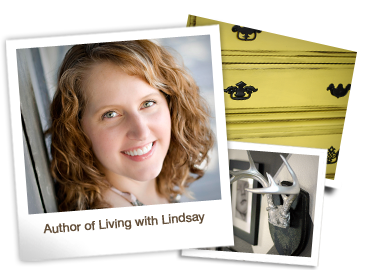 I love neutrals and I use them in both my wardrobe and in my decorating. I know the colors that make me the most comfortable. But knowing the colors you love can sometimes cause you to fall into a bit of a color rut. That's where a site like My Colortopia comes in! If you are afraid of color or even if you are comfortable in your color personality like I am, My Colortopia offers a great starting point for figuring out the colors that are right for you, or for helping you to shake your color personality up a little bit. For example, they have this fabulous widget that I have posted below where you answer a few questions and it suggests a color palette for you. Of course, I gave it a whirl...and check out one of the three palettes that it suggested for me. Does this color combination look familiar to you? Take a little look around my blog page. Hmmm. Those colors do seem familiar after all, don't they? Isn't that amazing?? 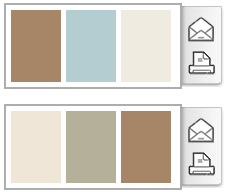 Here are the two other palettes the My Colortopia widget suggested for me. I sense a theme. ;-) I am definintely drawn to neutrals with a bit of subtle color thrown in there to add interest. Here's your chance to try the widget out for yourself. Just answer the questions and check out the palettes it generates for you. Have fun!